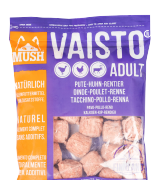 We make raw feeding easy! 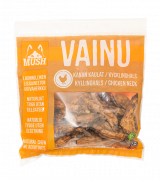 In our products we use the finest Finnish ingredients. Our mission is to provide cats and dogs with their ancestry diet. 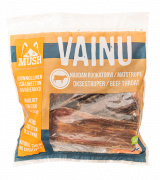 For cats this means raw meat, bones and organs. 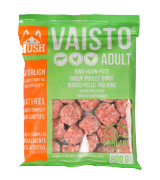 For dogs this means raw meat, bones, organs and some vegetables. 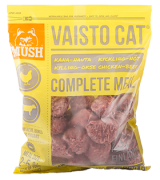 MUSH VAISTO® and VAISTO® Cat & Kitten are our raw complete meals for cats and dogs of all ages and life stages. 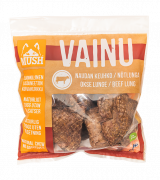 Our products are free from all grains, soy, rice, potatoes, corn etc. and contain no preservatives. 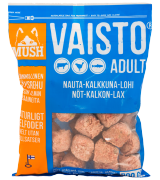 They are so easy to use and portion that absolutely no previous knowledge of raw feeding is necessary. 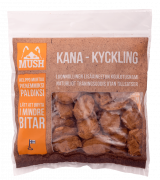 This is true also for all of our dried snacks and treats which only contain high-quality Finnish meat that is dried to a crisp perfection. 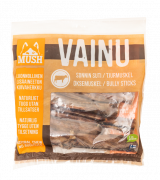 MUSH VAINU® is a trailblazing Finnish dry treat series. 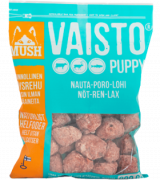 The assortment includes eight delicious and healthy treat options for jaws of all sizes– for dogs and cats of all ages. 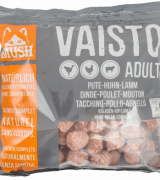 Keep those moments of indulgence interesting, by alternating between different treats. 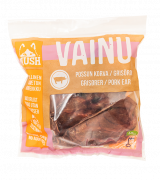 VAINU treats are the perfect choice for entertainment, awarding, activating or even on the go. 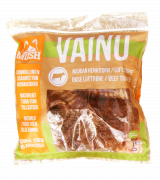 All VAINU products are made from Finnish ingredients in Finland– completely without additives and fungicides. In the beginning, dogs ate meat, bones, organs, vegetables and fruit. A few decades ago, we started to feed them grains as well. However, it's not what dogs were meant to eat. Because we only use meat, bones and organs, some vegetables and natural oils. 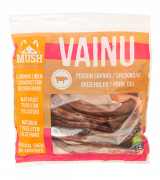 No additives, preservatives nor grain. Because fast freezing ensures, that all the natural nutrients are preserved in the most effective way. As we only check, mix, grind and freeze our fresh ingredients. 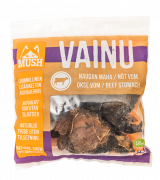 Because all the nutrients are in their natural form and the good bacteria and enzymes are preserver better in raw food.